Date: 28th & 29th July 2007. Location: Arnedo, La Rioja, Spain. 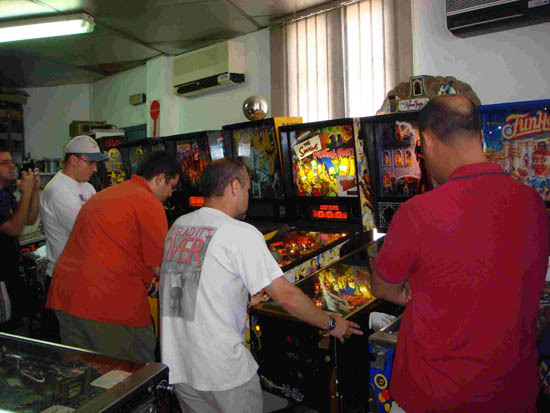 The last weekend of July was the date chosen by Spanish pinball fans to celebrate our annual gathering. 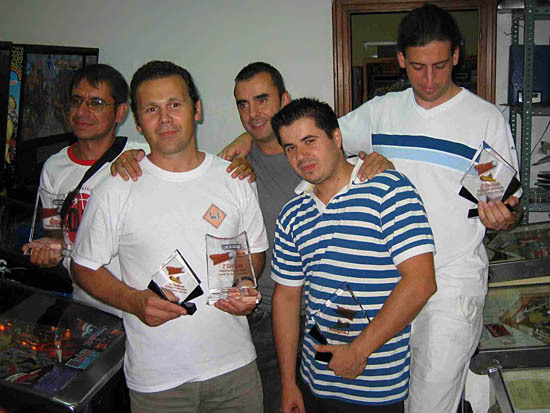 This was the 7th time the tournament had been held and thanks to one of the greatest collectors in our country - Basilio García - it was possible to host it in the village of Arnedo, La Rioja, which is where he keeps his nice collection of pin tables as well as several classic arcade games. 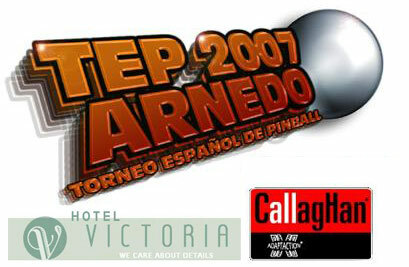 Spain was the second country by the number of pinballs manufactured; far behind from the USA and far ahead of any other country in the world, although only some of the models were exported. 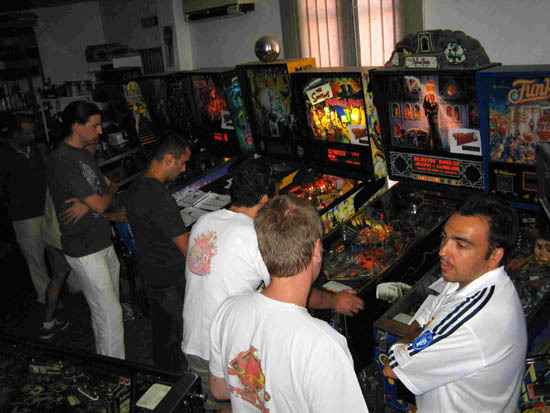 Therefore all of T.E.P.s have had an special feature: a good number of the machines played were made by Spanish manufacturers. 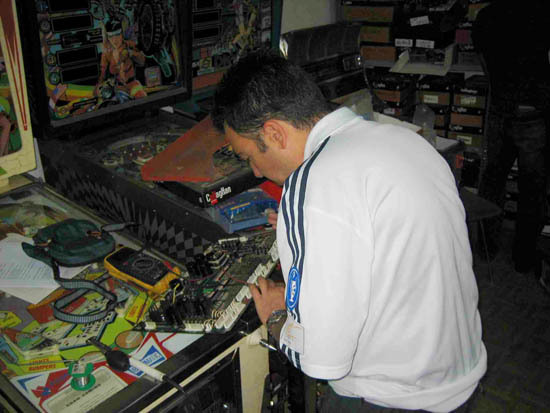 It's not an easy matter to bring together Spanish pinball fans in one event, so we were deeply satisfied with the number of this year's participants, as we reached 19 people. Not a big deal for other countries but a record for Spain. 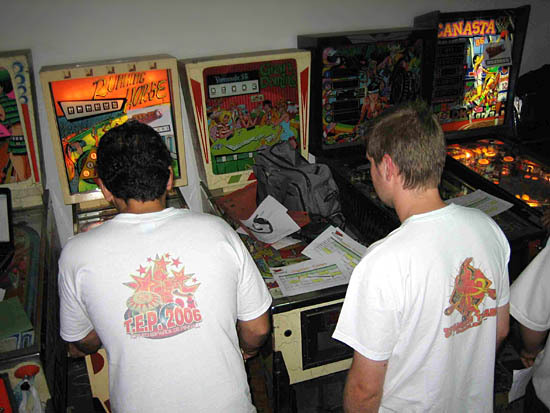 In past events, the qualifying round was playing on modern DMD games as well as classic EMs and Spanish made pinballs. It was an interesting mix, but our "European Experiences" (mainly the EPC) showed us that we should concentrate our efforts on modern games, so in this T.E.P. we decided to have two competitions: a Main Tournament for pins made in the ninetys and later, and a Classics Tournament for the rest of the tables. Unfortunately Scared Stiff, Johnny Mnemonnic and Miss Universo couldn't be arranged for the competition, but we still had a good bunch of tables to choose from. Finally, qualification for the main tournament was contested on Congo, TAF Gold, Simpsons PP, Monster Bash, Medieval Madness and Revenge from Mars, while Centigrade 37, Shamrock, Running Horse, Evil Fight and Canasta '86' were the qualification tables for Classics Tournament. Both competitions had a qualification round, a playoffs round and 4-players final. Qualification rounds were played on Saturday. On Sunday morning the playoffs took place and after them, the exciting finals. In the Classics Tournament, one of the finalists had to go back home before the match. Therefore this guy, Richard Dadd, achieved 4th position. 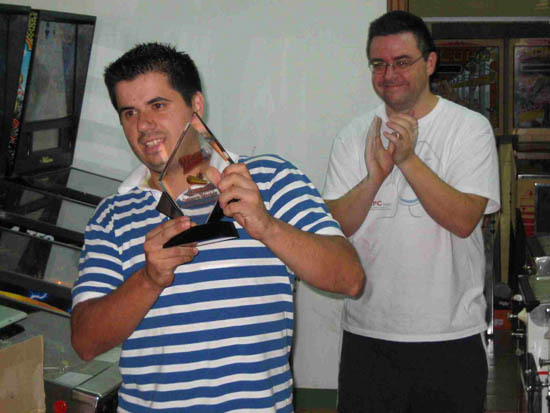 After a quick 3-players 5-balls per player match on Inder's Canasta '86', Remi López got 3rd position, Gonzalo 'Petaco' Miranda managed to reach 2nd position and the winner was David Pérez. Only the grand final of the Main Tournament waited to be played. 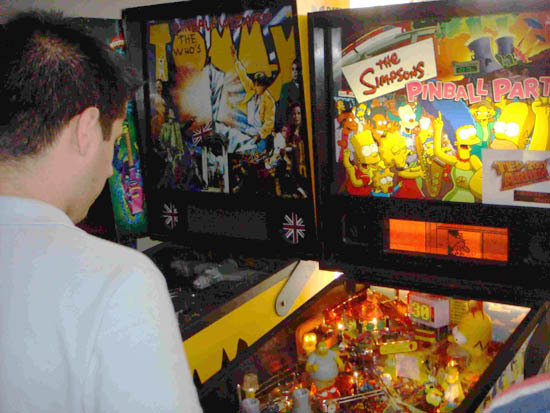 The chosen pin was The Simpsons Pinball Party and it was going to be adjusted to 5 balls per game, but due to lack of time it had to be played with 4 balls per player. After a first wizard ball, Gonzalo "Petaco" Miranda put a long distance between him and the rest of the participants. That single ball proved to be out of reach for Juaney, who finally got 4th place. In a nice demonstration of skill, Paco J. Arjonilla used his 3rd ball to catch Gonzalo and left the outcome uncertain. Meanwhile Julio Vicario used his 3rd ball to give a good advance to his score, but still far away from the two leaders. After that 1st ball, Gonzalo couldn't repeat such a skilled demonstration and his 3 remaining balls were OK, but not that great. Anyway, he was leading the scoreboard after his 4 balls, but Paco J. Arjonilla and Julio Vicario still had one ball left to play. Paco started his 4th ball and while not as good as the 3rd, it was good enough to overcome Gonzalo's score. He was in the lead now and the remaining person to play their 4th ball, Julio Vicario, was quite a way behind with his score. But the magic that touched Gonzalo in his 1st ball and Paco in his 3rd, now played over Julio's hands and he played an impressive last ball that gave him the championship. And so Julio is our new "Rey de Petacos" for this year. We greatly exceeded our published schedule, so after a brief trophies ceremony and the last few pictures, we all departed to our houses with a new bunch of great moments spent together in our memories. I can't finish without giving thanks to Basilio García: His hospitality and disposition made us feel like at home. 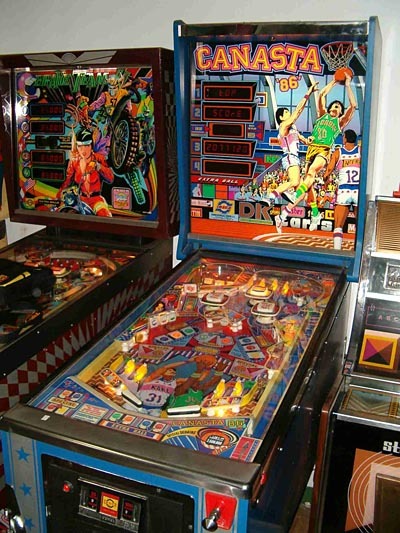 Gracias Basi, gente como tú le da vida al pinball en nuestro país (yes, it's Spanish :). I must also give thanks to our sponsors, Callaghan Shoes and Hotel Victoria in Arnedo, La Rioja. You can enjoy an excellent video edited by Magod Works at Tecnopinball site. I can't wait for the 2008 T.E.P. ! !